When the most eligible Earl of Rule offers for the hand of the beauty of the Winwood family, he has no notion of the distress he causes his intended. For Miss Lizzie Winwood is promised to the excellent, but impoverished, Mr Edward Heron. Disaster can only be averted by the delightful impetuosity of her youngest sister, Horatia, who conceives her own, distinctly original plans . . .
One of the most honest stories written by Heyer, read outstandingly by Phillida Nash. Her interpretation of character is perfect. A more interesting plot line than in other Heyer novels with a rather modern heroine. Good fun and easy listening. I like most of this author's work and this is one of the best. The narrator brings it alive and delivers a truly satisfying performance. Always one of my favourites! Wonderfully researched and narrated. In this world of misery and devastation, Georgette Heyer provides us with a sublime world of romance and humour. 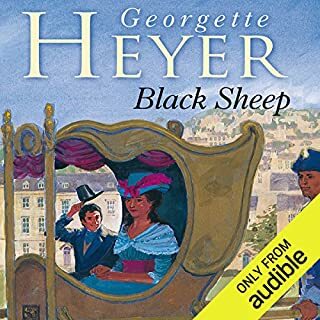 I gave up calling Georgette Heyer a "guilty" pleasure a long time ago. A literature major, I was taught that certain genres of writing are just inherently inferior - and one of them, of course, is Romance. Now I know that good writing is good writing, whatever the genre, and writing doesn't get any better than in "Venetia"! The story is a fairly common one in historical romance: "good" girl heroine attracted to "bad" boy hero. But Heyer does it so well here. The characters (major and minor) sparkle with humor, wit and personality. There are even valuable lessons in tolerance and reserving judgment. Venetia is an exceptional leading lady, full of life and heart, and I predict that anyone (even those who aren't big Romance fans) will fall in love with her, with her flawed love, with her brother, and even with those minor characters who so perfectly reflect the oddities in our fellow humans. And no small credit goes to the wonderful Phyllida Nash, who narrates this with great energy and skill. "Venetia" has long been a favorite read; now it's also a favorite listen! 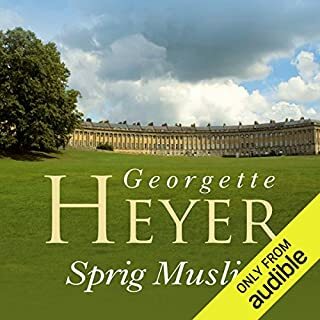 Along with Audible's versions of "Sylvester" and "Sprig Muslin", this will certainly appeal to Heyer fans and would be an excellent introduction to her really superior books. 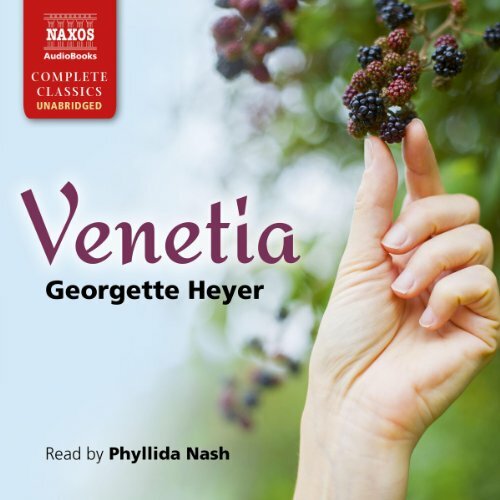 Hard on the heels of Naxos releasing "The Grand Sophy" and "Sylvester," two of Georgette Heyer's greatest, comes the equally wonderful "Venetia." All three books were written at the peak of Heyer's career. "Venetia" has a bit more melodrama than "Sophy" or "Sylvester," partly because of the reformed rake with a painful past that is the the hero, Lord Damerel. All her life Venetia has heard oblique references to her "delicate position," along with veiled warnings that she must be especially protective of her reputation, "so as not to be thought to be...." At which point her well wishers generally trail off and say something like "....but I must say no more on that head," leaving Venetia puzzled, to say the least. The arrival of the charming but brooding Damerel increases these warnings to a fever pitch, for reasons that the reader will probably guess before Venetia solves the mystery. 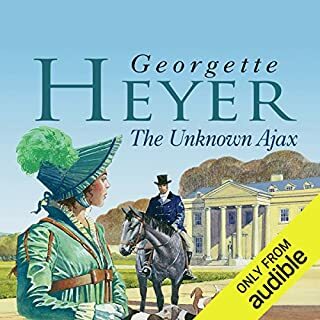 During her lifetime Georgette Heyer was said to resent the fact that her Regency romances were so much more popular than her mysteries or her historical fiction. I agree her mysteries are underrated (particularly "Envious Casca," which I think is a minor masterpiece that Masterpiece Mystery should dramatize immediately), but, whether she agreed with the assessment or not, her Regencies are in a class by themselves. The best of them -- including Venetia -- stand head and shoulders above the pack. Enjoy! 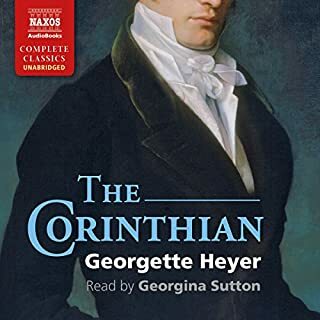 Georgette Heyer is considered the inventor of the Regency Romance, and although she wrote a wide variety of different types of novels, her comedies of manners set during the Regency period in England are among her best and the best in the field. This book has long been at or near the top of my list, the hero and heroine are both well read and intelligent and share a sense of humor, and I find their dialog to be a delight to read. And this book has more "face time" between the hero and heroine than many Heyer novels. Be prepared, Heyer wrote between 1921 and the early 1970's, and some of her assumptions seem strange to modern readers. But no modern author has been able to match her wit and insight. This book was first published in 1958 and written when she was in her prime. Phyllida Nash does a good job of giving the listener the proper feel for the story. Well worth my credit to get at once. 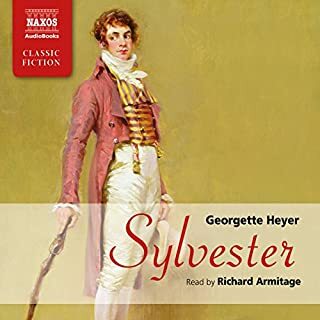 I am very glad that Naxos is releasing more unabridged Heyer stories. 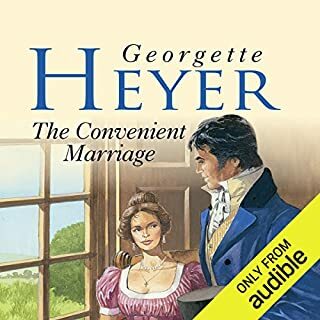 Their earlier abridged versions were not bad, but to get the most from Heyer one needs all the words, and I personally will never purchase an abridged title. 5 stars!! I wish I could give it more!! 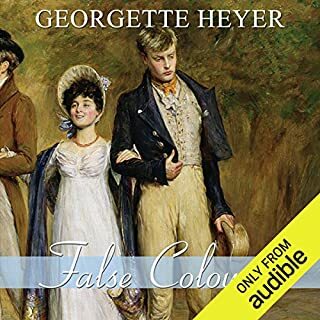 Georgette Heyer ' s books are delightful. They never cross the line, and always deliver a wonderfully charming story. This narrator, Phyllida Nash, reads the books very well,endowing the characters with life. (And her accent is a great asset.). Buy it. It's enchanting. This is one book I will listen to again and again. I enjoy Venetia Lanyon as one of Heyer's more unusual heroines. 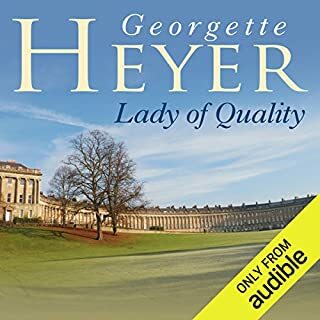 I can overlook the dated implication that she somehow inherited her relatively "loose morals" from her mother (and if you can't overlook dated ideas, you probably shouldn't bother with Georgette Heyer's novels), and just enjoy the character. 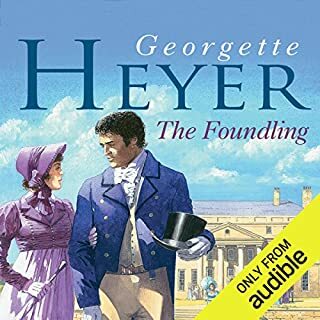 She's more implicitly sexual than many of Heyer's leading ladies, and it really is fun to follow the progress of a young woman who doesn't care about the social restraints of the Regency era AND who isn't schooled into submission for it. All that said, it's not my favorite Heyer novel. The characters, with a couple of exceptions, don't leap to life the way her best ones do, and there are long stretches between plot points. 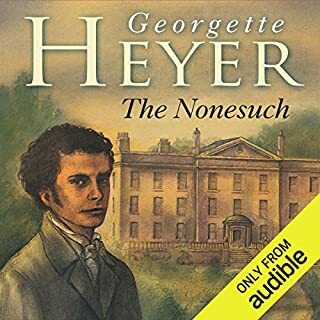 It's an enjoyable listen, and of course Phyllida Nash does a wonderful job here as in all her Heyer readings, but unlike greater favorites (Cotillion, Frederica, Lady of Quality, The Grand Sophy...), this one isn't bearing up to multiple listenings. 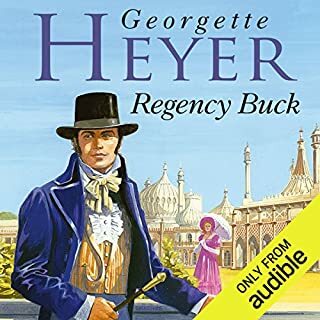 If you haven't tried Georgette Heyer, Venetia is a great place to start. Charming, humorous, fun heroine and hero, witty dialogue. Heyer simply writes a good story. And it's squeeky clean, safe for grandmother's ears. 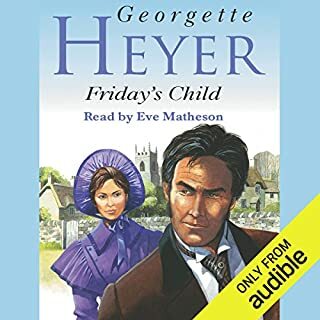 I was somewhat hesitant to try this narration in that I simply adored the version by Richard Armitage and feared I would be disappointed with another narrator, but I was most delightfully pleased by Ms. Nash's performance. I will certainly seek more books performed by her. I can't tell you how many paperback copies I wore out before audiobooks came out in affordable formats so I can take it in the car! The hero is that rarest of creatures, an honorable and likable rake, and the heroine too isolated from society to follow any rule but her heart. The conversations are sparkling and any debauchery only implied without being shown in graphic detail. The narrator allows me to lose myself in the story without being aware, which is the mark of great narration. This is a classic for a reason. Buy it! You won't be sorry. 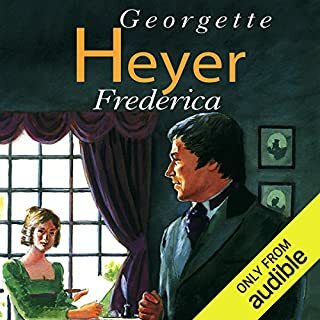 This was my second attempt at a Georgette Heyer book. They are so frequently recommended, but the first Heyer I read just didn't do anything for me. I thoroughly enjoyed Venetia, however. Phyllis Nash does an excellent job reading it, which probably helped more than a little, and the main character was fabulous. Funny storyline and great performance! The narrator did a wonderful job with voice inflections and accents. I love the humor and wit presented in Heyer's books. 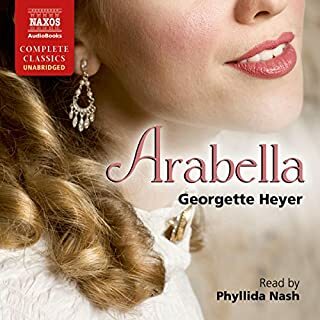 I was so happy to see another Georgette Heyer book narrated by Phyllida Nash, thank you so much! The story is one of my favorites, too, and Phyllida Nash gives it full scope with her wonderful reading. I am eagerly waiting for the next one as I am re-listening this one again and again :). Anyone who's read the book will know that, far than the slightly Barbara Cartland sounding publisher's 'summary' suggests, it's a wonderful comedy of manners with some strong characters and a great deal of humour. There is the usual strong cast of supporting characters, all distinct. I think I love the cameo of Sir Lambert Steeple as much as Sir Bonamy Ripple in False Colours, and they such have a lot in common. Edward Yardley, Venetia's 'worthy' suitor, is someone we'd never want to be stuck in a lift with. Aubrey, Venetia's younger brother, is genius in more ways than one, and as for Mrs Scorrier... she makes every mother in law in history look like sweetness and light. 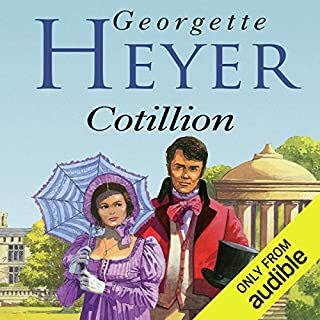 I left this till late in my journey through Heyer on Audible as a treat, and wasn't disappointed. Phyllida Nash nails them all, she doesn't just read it, she brings them all to life. Brilliantly - even the men's voices are spot on. Her best since The Talisman Ring as far as I'm concerned. If you've not listened to this one yet, put your feet up and prepare to enjoy yourself. Would you listen to Venetia again? Why? Which character – as performed by Phyllida Nash – was your favourite? Phyllida Nash can make her voice so very different when describing each character that I have no particular favourite, They are all beautifully described. 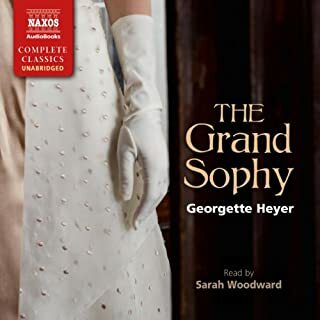 The supreme female readers of Georgette Heyer's novels are Sian Phillips and Phyllida Nash, I have never been disappointed in their interpretation. Sarah Woodward also made a splendid job of The Grandy Sophy. What about publishing some of Heyer's detective stories too? One of her best books! One of my favourite GH books, as there is so much sparkling dialogue between hero & heroine. It is also one of her less improbable story lines - the plot is on the whole believable! These things could have happened in that era, but I liked the fact that hero & heroine were resisting the established norms! The reading is excellent - I particularly liked her portrayal of Damerel. Venetia has been one of my favourite Heyer's since I was a teenager. I have had a different audio version for years, which I have thoroughly enjoyed except that it was abridged. I finally spent a much valued credit on this unabridged version. No regrets. Phyllida Nash reads Heyer beautifully. She has a wonderful range of voices for all the characters, including the males. She manages to convey laughter in her tones at exactly the right time too. Her light touch brings out all the humour, and the whole story comes to life. 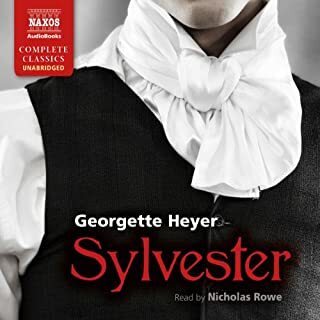 Since Audible seems to be producing new recordings of Heyer to replace outdated versions, I hope there could be new recordings of "These Old Shades", "Devil's Cub", and "Frederica", to name a few. The narration on those available at present is so bad I will not buy them. I am sure Phyllida Nash would read them delightfully. Lovely listenable nonsense. Great narration, well drawn characters, most diverting. Very worth a download if you are looking for escapism. Where does Venetia rank among all the audiobooks you’ve listened to so far? Have you listened to any of Phyllida Nash’s other performances? How does this one compare? a world apart from now, so refreshing! enjoyed the characters. I love period books. the narrator is ace! 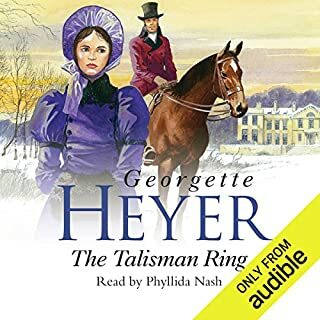 Phyllida Nash is such a good narrator of Georgette Heyer books there is no beating the combination. I wonder why she does not narrate them all. I for one wish she would. This excellent combination has made me very happy.